Porcelain veneers in Waco are one of the best ways to achieve a flawless smile! They can disguise all sorts of imperfections, from discoloration to chips and cracks to minor misalignment and gaps. Unfortunately, our ancestors weren’t able to take advantage of veneers to get the gorgeous grins they longed for. These little dental devices are a relatively modern advancement. How did porcelain veneers get to where they are today? Porcelain is one of the most common substances that dentists use to restore and beautify teeth. However, it hasn’t always been used in dentistry because of the problem of shrinkage; the porcelain would change shape when it was fired, making it difficult for dentists to make restorations that were the right size. A French dentist found the solution to this issue in the 18th century. Thus, porcelain dentures stepped onto the scene in a big way. Before porcelain became popular, other materials, such as wood, gold, ivory, and silver were common in dentistry. Porcelain proved superior because it does not rot, it looks natural, and it is durable enough to stand the test of time. It wasn’t until the 20th century that porcelain took on a more cosmetic role in dentistry. In the 1930s, dentist Charles L. Pincus changed the way people thought about porcelain when he crafted a tooth-shaped object out of porcelain and then used denture adhesive to attach it to the front of a celebrity’s tooth. It was the first porcelain veneer! Of course, this first veneer was a very temporary way to correct a smile’s appearance. It wasn’t until the 1980s that porcelain veneers as we know them became popular. This was thanks to the process of porcelain etching, which made it possible for veneers to adhere more permanently to teeth. 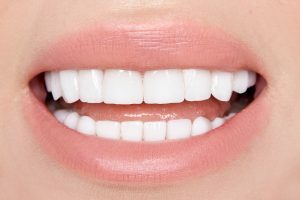 Modern porcelain veneers from your dentist in Waco are a beautiful and simple solution to correct unsightly flaws in a smile. They are ultra-thin and adhere firmly to teeth, which means that they look natural. They’re also easy to take care of since you can brush and floss them just like you would with the teeth that nature gave you. It takes as few as two visits to your dentist to get your new smile. During the first visit, your dentist prepares your teeth by removing a thin layer of enamel so the porcelain aligns with your smile. You wear a temporary veneer until a laboratory finishes making your custom veneers. On your second visit, your dentist installs your dazzling new look. Porcelain veneers from your cosmetic dentist in Waco are a modern marvel! If you’re unhappy with the way your smile looks, why not ask your dentist about how you can get the brilliant look you’ve always wanted? Dr. Rick Cofer has been helping his patients achieve healthy, beautiful smiles for years. If you are interested in porcelain veneers, you can put his expertise to work! Feel free to contact our office at 254-732-0309 to learn more about how Dr. Cofer can transform your look. by: Dr. Rick Cofer at November 14, 2017 .